Some of the most enduring songs are the ones that completely buck tradition and convention, that is, they’re songs that a publisher would laugh you out of his office over if you were pitching. It’s possible that, if Dire Straits hadn’t cut “Sultans of Swing,” it might never have been recorded. Four verses, a guitar solo, another verse, another solo and out, almost six minutes – no chorus or bridge? Almost unheard of. Thankfully the writer of that song was an artist as well, and what an artist. Great writer, great guitar player, distinctive vocalist – Dire Straits leader Mark Knopfler was the whole package, and when the world finally heard his group’s debut album in 1978 a star was born. 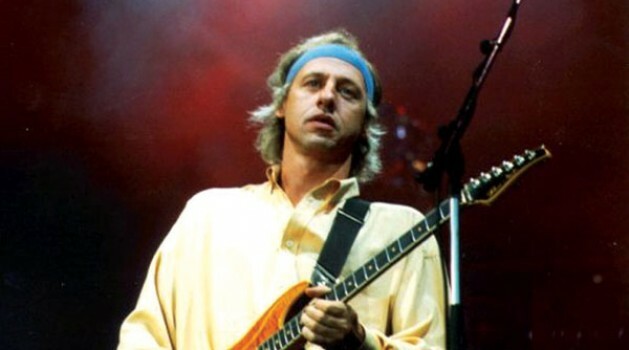 Knopfler had been playing and writing for more than a decade, making a living as a journalist and a lecturer before the band’s eponymous Dire Straits album hit. Produced by Steve Winwood’s less celebrated brother Muff, it took months for the album to attract any attention, and “Sultans of Swing” was actually released as a single twice before the public caught on. “Sultans of Swing” was a song about some guys who had a band on the weekend that could have been written about any cover band in any town in the world, not just a band playing Dixieland in London. With memorable, perfectly-timed licks on a clean-sounding Strat, it’s a study in barre chords in D minor, sometimes changing to the relative major chord, F, at both the first fret and at the fifth fret to suspend the C chord. With “Sultans of Swing” a breath of fresh air was exhaled into the airwaves in the late ’70s. Sure, Donald Fagen and Tom Waits were writing great lyrics about characters you’d love to meet and Jeff Beck and Eddie Van Halen were great guitar players. But Knopfler, he could do both things as well or better than anybody out there in his own way, and didn’t seem to have any obvious rock influences unless you try to include Dylan. Like his contemporary and future duet partner Sting, Knopfler’s ideas were intellectually and musically stimulating, but were also accessible to the average listener. It was almost like jazz for the layman. “Sultans of Swing” was a lesson in prosody and tasty guitar playing that has seldom been equaled since. If you aren’t familiar with “Sultans of Swing” or haven’t listened to it in a while, you should definitely check it out.